VATICAN CITY (CNS) — Visiting Rio de Janeiro, the chief organizer of papal trips confirmed Pope Francis will participate in the key events of World Youth Day July 23-28 and he said other parts of the papal trip are being tailor-made for the new pope. “We had a tunic made to measure for one pope, and now we need to make another. The program will be updated” to fit the ideas and style of Pope Francis, Gasbarri said in a statement released by the Brazilian bishops’ conference April 24. After discussing the plans with Pope Francis, Gasbarri arrived in Rio April 23 to meet with Brazilian church officials and the local World Youth Day organizing committee as well as local, state and national government officials to review the plans and discuss ideas. He said the main focus of the pope’s July trip will be World Youth Day in Rio; while Gasparri did not mention other stops on the papal itinerary, Brazilian media reported that that the papal trip organizer visited the National Shrine of Our Lady of Aparecida April 24. Brazilian President Dilma Rousseff, who met the pope a few days after his election in March, said Pope Francis intended to visit the shrine, which is about 165 miles west of Rio. The papal trip organizer confirmed that Pope Francis would participate in the events traditionally presided over by the pope. Those include a July 25 evening service at which the youth officially welcome the pope; the Way of the Cross service July 26; the nighttime vigil July 27; and the closing Mass July 28. Gasbarri did not, however, release the exact dates or full itinerary of the pope’s trip. 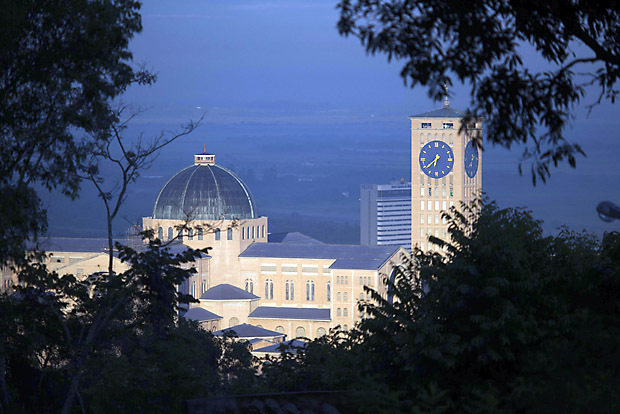 Jesuit Father Federico Lombardi, the Vatican spokesman, told reporters April 25 that the Brazil event and a probable visit to Assisi were the only trips on the pope’s schedule for the rest of 2013. He said he did not think the pope would visit Argentina in December, as some Argentine media have reported.